The last turkey sandwiches and scraps of pumpkin pie are gone, the final breakfast of hot coffee and cold stuffing finished, and suddenly, another holiday is sending you back into the kitchen, this time to fry, fry, fry. Chanukah, the Jewish Festival of Lights, comes early this year, starting the evening of Wednesday, December 1st and ending 8 days later on December 9th. Last year, I passed along all my must-have tips for latkes, the potato pancakes that are the festive centerpiece of family dinners during this holiday. Now, onto the borscht! You wouldn't necessarily think, given how many people (Barack Obama included) shudder at the very thought of a beet, that a pot of beet-and-cabbage soup could best a platter of crispy, greasy, fried potatoes slathered in sour cream and applesauce, but I've seen it happen. Every year at my annual Chanukah party, folks come for the latkes but stay for the borscht. Waiting for the next round of potato pancakes to come out of the frying pan, they drift over to the big pot of magenta soup at the back of the stove, scoop out a bowlful, dollop on the sour cream, and before I know it, they're at my elbow, demanding to know "what is in this soup??" They don't really believe me when I tell them it's nothing but dowdy root vegetables like turnips and parsnips, dill, a little cider vinegar and a whole bunch of beets and cabbage. Inspired by the dreamy borscht served at the marvelously glamorous, original incarnation of the Russian Tea Room in New York City, my borscht has adapted over the years, to where there's hardly even a recipe to follow. Onions, leeks, and garlic are sauteed to start with, then followed by a bowlful of whatever could survive a Russian winter, usually a combination of carrots, parsnips, turnips, celery root, and rutabaga, then chopped or grated beets and finely sliced red cabbage, all seasoned with plenty of salt, caraway seed, and a few twigs of sage or thyme. Because I usually make my borscht vegetarian, I add a big can of diced tomatoes (Muir Glen's fire-roasted tomatoes are particularly nice) to give body and a bit of acidity to all that root-vegetable sweetness. Water to make up however much liquid is needed, and then, the crucial splash of red-wine or apple-cider vinegar for tartness. A gentle simmer for 45 minutes or so, an adjustment of salt or vinegar, a hefty stir-in of chopped fresh dill, and the borscht is ready. Like every winter soup, it improves with age, and can be made a day or two ahead of time. My Polish landlord has promised to have me over for borscht sometime this winter. The red borscht that I know, he says, is a specialty of eastern Poland and Ukraine. In western Poland, however, they make a white borscht with sausage, potatoes, and zur, a tart, cloudy liquid fermented from rye meal and rye-bread crusts. I haven't yet tried this kind, since it sounds like it needs a freezing-cold, months-long Eastern European winter to properly accompany it. 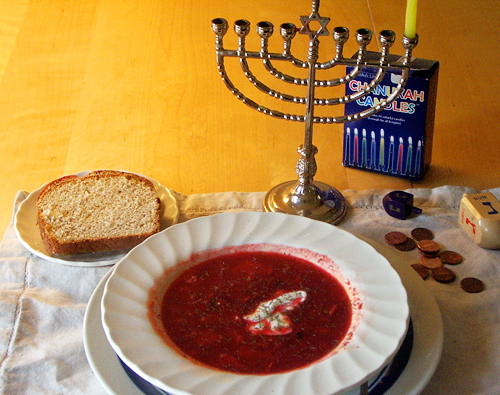 In my Jewish experience, there are two kinds of borscht: the cold kind, made only with beets, that you mix with sour cream to a lurid hot-pinkness and drink from a glass, and the belly-filling winter kind, chock full of cabbage, beets, and root vegetables, served with a dollop of sour cream on top, challah or rye bread on the side. I generally make mine vegetarian, since I'm usually making borscht for a crowd, but many cooks make theirs with meat, chunks of fatty, tough but flavorful beef cooked on the bone to give body to the broth. A shot of vinegar keeps winter's appetite sharp, although now that everyone's madly pickling, you could add in some naturally fermented sauerkraut juice, perhaps and some sauerkraut, too, or a few diced pickled beets with their juice. It's impossible to make a small amount of borscht. Anyway, why would you want to? It keeps well and can sustain you for days. The amounts listed here are approximate, since the amount of borscht you make should be constrained only by the size of the biggest pot you have. Sour cream--the real stuff, with no additives, and definitely NOT "lite" or nonfat. If you truly won't (or can't) bear the full-fatness, use non- or lowfat Greek yogurt instead. 1. Over medium heat, heat oil in a large, heavy soup pot. Reduce heat, add onions, leek, and garlic. Cook, stirring, until softened and translucent but not browned, 5 to 8 minutes. 2. Add chopped carrots, parsnips, turnip, celery root and rutabaga and cook, stirring, until vegetables are slightly softened, 8-10 minutes. Add beets and cabbage and cook for another few minutes. 3. Add salt, caraway, and thyme. Add tomatoes and juice, white beans if using, and enough water to cover vegetables. Add vinegar to taste. Bring to a simmer, then reduce heat to keep soup at a gentle simmer. Partially cover and let cook until vegetables are tender and flavors have blended, about 45 minutes. 4. Adjust salt and vinegar. To serve, top each bowlful with a generous sprinkle of fresh dill and a dollop of sour cream.